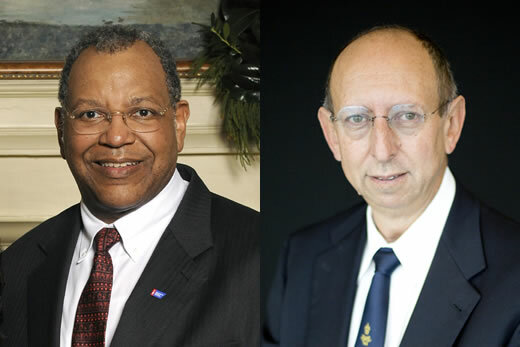 The National Academy of Medicine (NAM), formerly the Institute of Medicine, has elected Otis W. Brawley, MD, and Keith P. Klugman, MD, PhD, to its new class of 70 new members and 10 international members. Brawley, who is chief medical officer for the American Cancer Society, is professor of hematology, medical oncology, and medicine In Emory University School of Medicine and the Winship Cancer Institute, and professor of epidemiology in Emory’s Rollins School of Public Health. Klugman is director of pneumonia programs for the Bill and Melinda Gates Foundation; emeritus William H. Foege Professor of Global Health in Emory’s Rollins School of Public Health; and honorary professor, University of the Witwatersrand Respiratory and Meningeal Pathogens Research Unit, Johannesburg, South Africa. Membership in the NAM is considered one of the highest honors in the fields of health and medicine, recognizing individuals who have demonstrated outstanding professional achievements and commitment to service. Current active members elect new members from among candidates nominated for their accomplishments and contributions to the advancement of the medical sciences, health care, and public health. "Otis Brawley and Keith Klugman have made tremendous contributions to the health of children and adults in the United States and globally," says Michael M.E. Johns, MD, executive vice president for health affairs, Emory University and president, CEO, and chairman of the board, Emory Healthcare. "I am extremely proud of their accomplishments as Emory faculty and also their leadership in two of the world’s leading organizations focused on global health – the American Cancer Society and the Bill & Melinda Gates Foundation. Otis Brawley, in his role at the American Cancer Society, is responsible for promoting the goals of cancer prevention, early detection and quality treatment through cancer research and education. He champions efforts to decrease smoking, improve diet, detect cancer at the earliest stage, and provide the critical support cancer patients need. He also guides efforts to enhance and focus the research program, upgrade the Society’s advocacy capacity, and concentrate community cancer control efforts in areas where they will be most effective. As an acknowledged global leader in the field of health disparities research, Brawley is a key leader in the Society’s work to eliminate disparities in access to quality cancer care. From 2001 to 2007, Brawley was medical director of the Georgia Cancer Center for Excellence at Grady Memorial Hospital and deputy director for cancer control at Winship Cancer Institute. He previously served as a member of the ACS Prostate Cancer Committee, co-chaired the U.S. Surgeon General’s Task Force on Cancer Health Disparities, and filled a variety of capacities at the National Cancer Institute (NCI), most recently serving as assistant director. Brawley is a member of the Centers for Disease Control and Prevention (CDC) Advisory Committee on Breast Cancer in Young Women. He was formerly a member of the CDC Breast and Cervical Cancer Early Detection and Control Advisory Committee. He served as a member of the Food and Drug Administration Oncologic Drug Advisory Committee and chaired the National Institutes of Health Consensus Panel on the Treatment of Sickle Cell Disease. Among numerous other awards, he was a Georgia Cancer Coalition Scholar and received the Key to St. Bernard Parish for his work in the U.S. Public Health Service in the aftermath of Hurricane Katrina. Brawley is a graduate of the University of Chicago, Pritzker School of Medicine. He completed his internship at University Hospitals of Cleveland, Case-Western Reserve University, his residency at University Hospital of Cleveland, and his fellowship at the National Cancer Institute. Keith Klugman is one of the world's leading experts on antibiotic resistance in pneumonia. He helped develop the pneumonia vaccine that is now part of the immunization regimen for children in the United States. As a result of his research findings, invasive pneumococcal disease among young American children has decreased by nearly 80 percent. A South African native, Klugman has also focused his research on ways to reduce deaths from pneumonia among children specifically in developing countries. Pneumonia claims 900,000 lives annually -- more than any other childhood disease, and Klugman’s work has led to tremendous strides in reversing that trend through vaccinations. In 2001 Klugman joined the Rollins School of Public Health, and in 2005 he was named the William H. Foege Chair of Global Health, funded by the Hubert Foundation in honor of Foege's contributions to the field. In 2003, the New England Journal of Medicine published the results of his landmark study that proved overwhelmingly that the pneumococcal vaccine had the potential to save the lives of thousands of children. Since then, Klugman has led efforts to make the vaccine available to children in Africa and Southeast Asia. Klugman's research now focuses on the evaluation of vaccine effectiveness in rural South Africa by looking at the ecology of the pneumococcal bacteria pre- and post-vaccine. Ultimately, he expects the results to show that the vaccine protects children up to age five and interrupts disease transmission to unvaccinated children and adults. While at Emory, Klugman and his collaborators embarked on the largest project ever to sequence the 20,000 pneumococcal genomes. The team is collecting strains of the bacteria before and after the vaccine is rolled out in four countries in Africa and will analyze existing strains in the United States, Asia and South America. Through genetic sequencing of these strains, they hope to identify the genomic changes associated with bacterial escape from the vaccine. In his current position, Klugman is now advisor to the five-year study, which continues at Emory, funded by the Bill & Melinda Gates Foundation, in collaboration with the CDC, the University of Cambridge in England, the National Institute for Communicable Diseases at Wits University in South Africa, the Wellcome Trust Sanger Institute unit in Malawi, the Medical Research Council in Gambia, and the Kenya Medical Research Institute. The Institute of Medicine (now the NAM) was established in 1970 under the charter of the National Academy of Sciences to advise the nation on medical and health issues. The newly elected members raise NAM’s total active membership to 1,826 and the number of international members to 137. With the election of Brawley and Klugman, Emory currently has 25 members in the IOM.